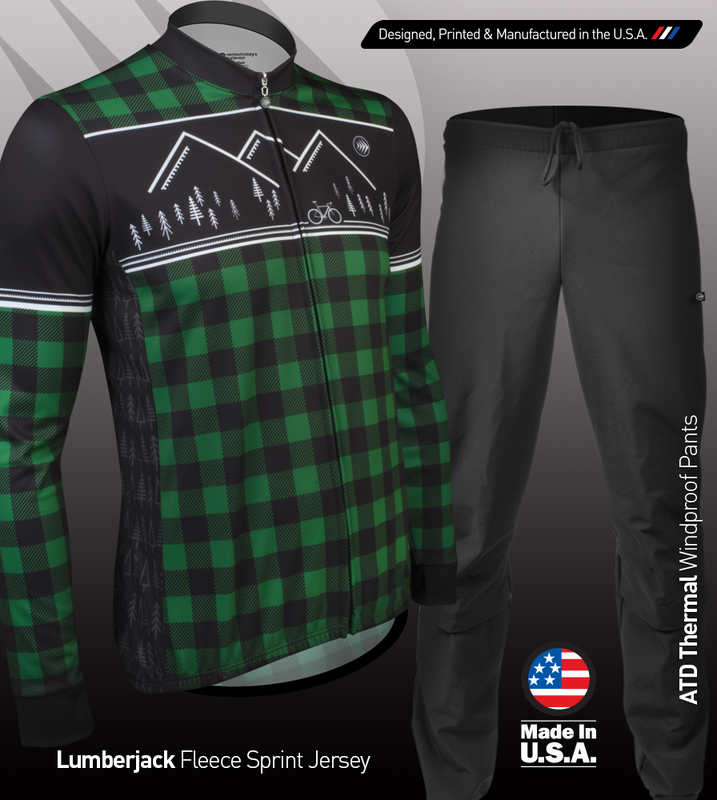 Aero Tech Designs Lumberjack Cycling Jersey – Cure Your Cabin Fever! Are you longing for the great outdoors, wanting to be surrounded by the wilderness of rugged mountains and thick forest woods, but find yourself trapped in an urban jungle? Or are you the brawny type who finds comfort within a log cabin, sipping a home brew in front of a fire? 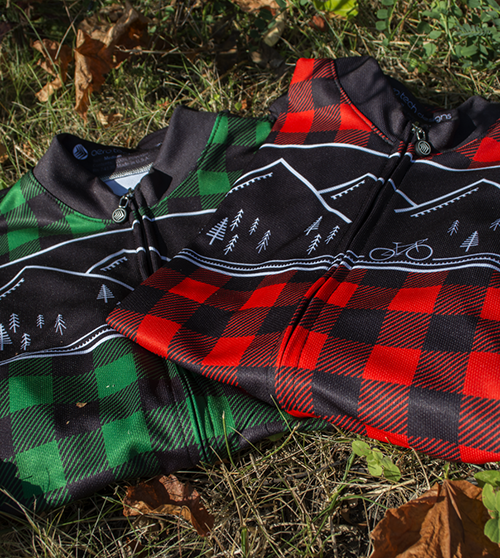 Designed, printed, and manufactured in our U.S.-based factory, this plaid cycling jersey will bring out your inner lumberjack. With this performance enhanced jersey, you will not only ride longer and feel stronger -- you’ll be able to chop up the trail ahead. This peloton long sleeve cycling jersey is made with 100% Polyester MicroFleece to keep you warm while wicking away moisture. Perfect for cycling through the woods and mountains! The back panel is lengthened to keep out the blustery winds around the backside and midriff. Raglan sleeves fit snug around the shoulders without impairing mobility. The sleeve cuffs stretch to conform to your wrist and fit perfectly into a pair of cycling gloves. The jersey has a full-length zipper with a large Aero Tech Designs pull tab that is easy to grab with one hand, even while wearing gloves. A reflective tab in the rear adds visibility for those long night rides in the woods. Three generously-sized rear pockets are designed for easy access and reinforced for long life. Need to carry a flask? A neck warmer or spare beanie? The keys to your cabin? It can even stretch to hold a small hatchet. Plenty of room for all your cycling and lumberjack needs! The cycling jersey imitates the flannel plaid shirts that lumberjacks are known to wear. The picture featured across the chest and back shows a mountain landscape with a small forest of trees spread across the bottom. A lone bicycle is cycling down the mountain road, taking in all the majestic and rugged scenery before it heads home to its cabin. The wrist cuffs and collar are black to seamlessly blend in with any masks and/or gloves cyclists choose to wear, but also adds a stark contrast to the surrounding plaid pattern of the long sleeve jersey. You have two colorways to choose from: a woodsy forest green and a bright cardinal red. The design is sublimation printed onto the jersey, so these colors will not fade – no matter how many logs you chop or mountain trails you climb. We print and manufacture each jersey in our own U.S.-based factory, so this jersey is built to last! It's okay to admit you want to be a lumberjack. Who doesn't want to chop wood and haul an axe? 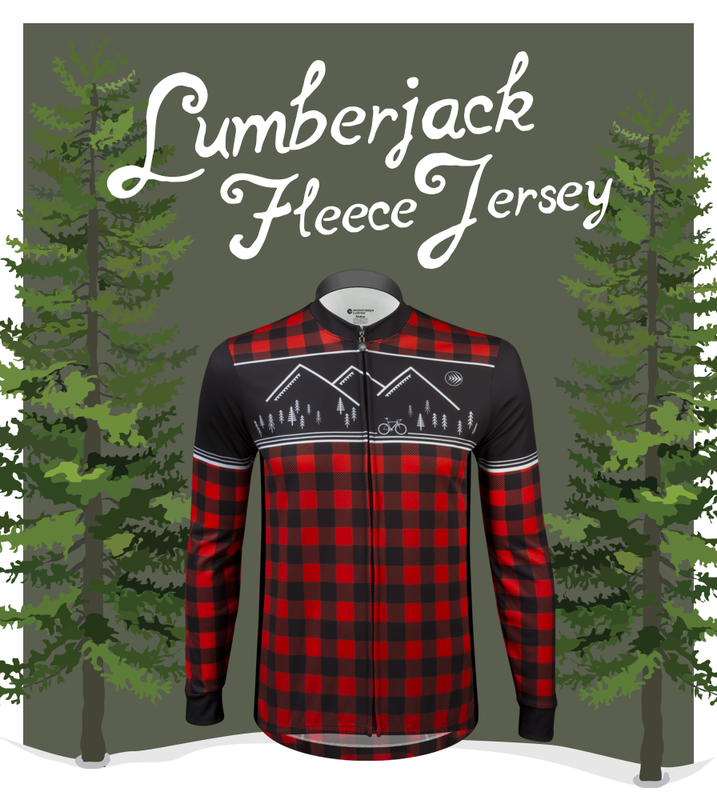 Cure your log cabin fever with this lumberjack cycling jersey! I took this out for a ride the other day and I liked it. The material is slightly lighter than some long sleeved jerseys, but that isn't a problem for me. When biking in Winter I'm usually wearing layers anyway.. Warm and comfortable with exceptional wicking. I've only worn it as a layer so far. I can't wait to wear it without a shell. It's too unique to keep hidden. I ordered two of the green jersey's and they are awesome! My husband is wearing his right now in the 'Ride the Rockies' event. Ordered the L for him - 165lbs, 5'11 and it fits perfect. Ordered a L for me as well. I'm 5'4" and also 165 but I have a chest............so, it fits around the bust perfectly and I can't say that about many jersey's on the market. The rest is a bit loose but I don't like a skin-tight jersey either. The elastic at the bottom hem helps keep it in place. Love it!